Hi, I am interested in your 1966 Ford Mustang (stock #4698-ATL) listed on Autotrader for $61,995. I'd like to get more information about this vehicle and confirm its availability. The outstanding curb appeal and rock solid running condition of this 1966 Ford Mustang GT Fastback come as the result of a thorough rotisserie restoration, where it was taken all the way down to its core before being brought back to factory specifications. It will arrive in its next owners garage with build receipts and restoration photos on hand to document both the skill and expense that went into its re-ascendance to awesomeness. The Ivy Green shade now draped over the exterior mirrors the same shade it rolled off the showroom floor with and its been freshened up to a very strong condition. No shortcuts were taken - thats top-shelf PPG paint on display here that sits under a strong clearcoat, so its a got a great shine that really comes alive in the sun. The original bumpers in both front and back were re-chromed, so theyre looking great and the trim and bright work are in stellar shape. After having been taken down to its unibody frame and being inspected and prepped for the future, when the time came to put the pieces back together, it was done with plenty of precision - youll notice the lines on this vintage Mustang are very uniform, with nice, even gaps surrounding the doors, hood and decklid. The original badging was reinstalled and that, along with the original wheels at all four corners, is also looking very clean. Climb inside and youll be surrounded by a showstopping interior. Its been thoroughly refurbished to factory specs and is in outstanding condition. The front buckets are dressed in deluxe black vinyl Pony covers, with their signature running horses on the backrests, and in back the seating features the fold down option that was actually pretty rare when this 66 rolled out. The attention to detail inside these doors is impressive - in addition to all the new-looking components inside, every rubber seal and felt strip appears fresh and just underneath the black carpeting lining the floor youll find a layer of soundproofing in place to minimize road noise. The dash area has a show-ready appearance, with the factory gauges in its instrument panel clear and functioning as intended, a new-looking pad running across the top and a pair of woodgrain accents that are fresh as can be. The trunk area in back is as tidy as you could want, with a clean plaid liner covering its floor and a full size spare resting inside. The drivetrain on this classic was pored over with a figurative fine-toothed comb. In the process of its restoration the 289 cubic inch V8 was rebuilt to nearly stock specifications before being reunited with its 4-barrel carb - it was bored .030 for a little more displacement that readily translates into usable power. The engine sits in a very well-detailed compartment, with its properly painted blue engine block and manifold contrasted by a pair of chrome valve covers and a chrome air cleaner. Everything behind the motor got plenty of attention as well - the automatic C4 transmission and rear end were also rebuilt. To up the dependability factor of this 66 while on the road, a fresh cooling system was also installed, while its new suspension offers a quiet, smooth ride. Front disc brakes help bring this classic fastback to fade-resistant stops on its set of 14 wheels outfitted with BF Goodrich Silvertown radials. Below, the undercarriage looks pretty much as it did when this Mustang first began turning heads decades ago. 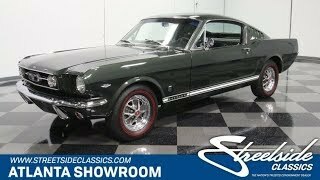 This 1966 Ford Mustang GT Fastback offers the rare opportunity to own an upper echelon representative of the model thats benefitted from a meticulous restoration, is looking outstanding and running in top form. Call today!